Earlier this year, mobile phone retailer Carphone Warehouse announced it was launching an Irish MVNO in 2015. This will involve some delicate tradeoffs ahead for Carphone Warehouse. Carphone Warehouse, an independent retailer of mobile phones and service contracts, has 92 shops around Ireland, selling mobile phones and contracts for all of the large mobile network operators in Ireland – Eircom, Vodafone, O2 and Three. When the takeover of O2 Ireland by Three was approved by the European Commission, certain conditions were set – in particular that to offset the reduction in competition in the Irish market caused by the removal of one player, O3 (as some industry wags have started to call the new merged entity) must enable two new MVNOs on its network. We now know that these will be UPC and Carphone Warehouse, both launching in 2015. As the biggest independent retailer of mobile phone contracts in the state, Carphone Warehouse has built a Irish strong business with sales of over €100M in 2013. However, that business was built on two pillars: a reputation for impartiality with the Irish consumer, and a market power that encouraged the mobile networks to do business with it. Now one of those pillars is under threat, as the other networks wonder whether their independent channel will remain so – or whether it will prioritise sales of its sister company over that of its competitors. Now, Carphone Warehouse has run a MVNO called Talkmobile in the UK since 2007 , so it has experience of balancing the needs of the two businesses. But nevertheless, the Irish networks will be watching Carphone Warehouse’s retail division closely for any sign of favouring their own child on the playing field. Christmas 2015 will be a crucial test for the networks. 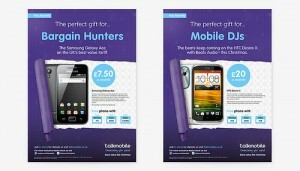 Will Carphone Warehouse’s stores deliver the traditional sales bonanza for the big mobile networks – or will the home MVNO (dare we call it Talkmobile.ie?) win out? For the Irish consumer it is important that the new MVNOs succeed, as competition in the Irish mobile market has been weakened by the reduction in number of big players from four to three. UPC’s mobile offering will likely only make sense to the consumer as part of a quad-play bundle, which puts the onus on a successful Carphone Warehouse MVNO to incrase competitiveness. Judging by the market position of the UK MVNO and the comments of Carphone’s Ireland CEO in this Silicon Republic interview, the MVNO will focus on the value end of the market – good news for Irish consumers. It will be a fine line to walk: be successful, but not at the expense of the lucrative retail business. This entry was posted in Uncategorized on August 18, 2014 by Simon Rees.